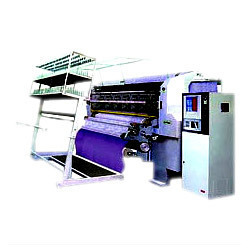 Aimed to serve the all needs and requirements of quilting industries, Sterling Creation deals in various type of computerized quilting machines, which include multi-needle mechanized quilting machines, shuttleless computerized quilting machines, straight line quilters and many more. Reflecting the perfect combination of quality and technology, These computerized quilting machines are offered by us in customized packaging and in bulk quantities. 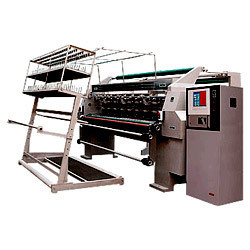 We offer multi needle quilting machines, which are widely used in the global quilting industries. Sturdily constructed, these multi needle quilting machines come in modern design and make the operation more safe and reliable. These multi needle quilting machines are capable of creating a lot of patterns and cams. Apart from this, these machines can be custom designed as per the drawings and cams specifications of our clients. Specifically designed shuttle holder- For making each stitch more precise & reliable. Automatic damp system of tension-For material feeding more equal & reliable and operation more convenient. Highly functional aircraft aluminum-alloy-bushless needle-drive parallelogram system - For assuring a smooth and frictionless high speed continuously working with minimum maintenance. Exclusive control system- For realizing intermittent and continuous feeding in one machine. Adjustable material pre-compression roll- For easing the quilting of thick fillings and spreading the top fabric preventing folds. Top fabric tray feeding device with adjustable brake- For giving a constant and accurate top fabric tension control to any kind of fabric, independent of the rolls diameter. Anterior feeding device and hinder rolling equipment – For working simultaneously with the quilting speed. Extraordinary adjustable (0~50mm) active roll feeding system – 1. For adjusting the materials of different thickness 2. Allowing perfect sewing without skipped stitches on very thick (or very thin) materials and exotic “puff” effects without destroying materials. Independent positive presser foot system, with wide possibilities of adjusting stroke and passage clearance- 1. For compressing thin or very thick filling materials (up to 50mm) 2. For allowing perfect sewing without skipped stitches on thin materials 3. Exotic “puff” effects with very tight stitching on very thick materials. Needle rows 3" x 2"
Exclusive design of upper creel – For making the exchange process easy of upper thread. Extraordinarily designed straight-line distance (min.1/4")- For making every line distance more precise. Unique adjustable (0~30mm) automatic feeding system of the roll- - For adjusting materials of different thickness - For allowing perfect sewing without skipped stitches on very thick (or very thin) materials - Exotic "puff" effects without destroying materials. For making sure the feeding of materials more equal and reliable and operation more convenient. Advanced "dot" presser system- - For allowing the reduction of resistance on presser-plate when quilting very thick materials - Making every stitch trace clear and compact with distinct third dimension without loose thread. The HA computerize quilting machines are one of the most advanced quilting machine in the world with a sturdy steel structure and new features like Jump and Tack facility, latest computer system enabling, ease of operation and the flexibility to make and edit new design. Extreme precision with 360º intricate patterns. Producing many kinds of sewing patterns such as: panel quilts with few needles, patterns with filled areas jump patterns, fine embroidery, signatures, trademark, etc. Unique design of upper creel makes it very easy to exchange upper thread. The operator can finish it conveniently in front of the machine without any climbing equipment. Unique adjustable (0~40mm) active roll feeding system can adjust ideally materials of different thickness and allow perfect sewing without skipped stitches on very thick (or very thin) materials and exotic “puff” effects without destroying materials. Unique design of shuttle holder makes every stitch more precise and reliable. Unique automatic tension-damp system on passive feeding (adjustable) ensures perfectly the more equal & reliable material feeding and more convenient operation. Unique “dot” presser system allows the reduction of resistance on presser-plate when quilting very thick materials and makes every stitch trace clear and compact with distinct third dimension (without loose thread). Up-to-date overall design has not only beautiful appearance but also perfect safeguard, which makes the operation more safe and reliable. It allows the cloth to move forward and backward at low or high speed.